Juan Samuel warming up his players before a 2017 game against the Milwaukee Brewers. The Phillies’ culture has changed so much in such a short time that it is easy to forget who the first man was to interview for the managerial job after Pete Mackanin was fired. Juan Samuel, just as he was for most of his playing career, served as the leadoff hitter. You have to wonder now if Samuel, a longtime and loyal member of the Phillies family, was wasting his time. The Phillies obviously wanted to dive into the deep end of the analytics pool, and a guy with an old-school reputation like Samuel’s was not going to be their man. “I didn’t think of it as a waste of time,” Samuel said during a recent phone interview. “At one point, I honestly thought I had a chance because I spent so much time in the interview room. I was there for over five hours. It gave me an idea of what they were looking for. Samuel’s only request of the Phillies was that they let him know as soon as possible if he was not a finalist for the job. The Phillies hired Gabe Kapler 19 days later, and there initially seemed to be some interest in retaining Samuel as part of the coaching staff. Rhys Hoskins shaking hands with then-Phillies third-base coach Juan Samuel after hitting a home run in a 2017 game. Kapler completed his coaching hires in mid-December by naming Jose David Flores as the first-base coach. By the time February rolled around, Samuel was still unemployed. 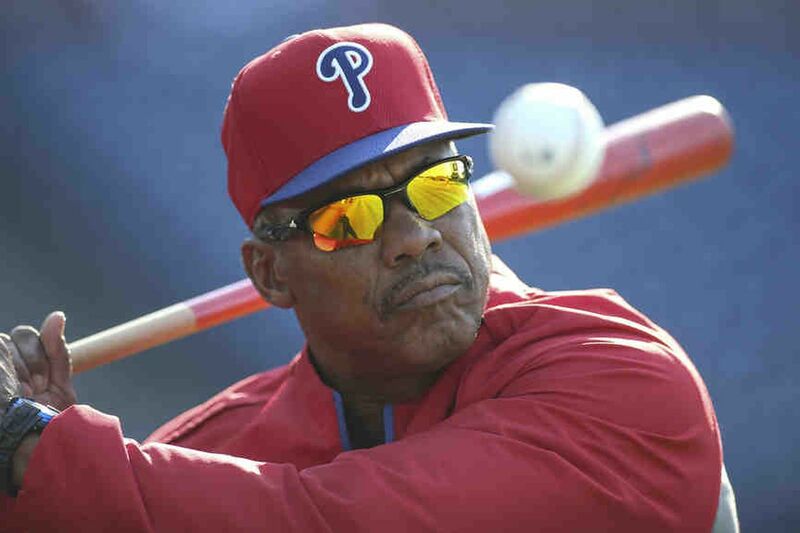 At age 57 and for the first time since the Phillies signed him as a teenager out of the Dominican Republic in the late 1970s, he did not have a job in professional baseball. He was OK with that for the short term. He had some weird moments throughout last year. He said he ran into some old baseball friends who thought he was still working as an adviser for the Phillies. He also spent some time running camps for Major League Baseball in Florida. The thing he enjoyed most, however, was spending time with family. It’s next year, spring training is a month away, and Samuel still does not have a job. His plan is to run some more camps for Major League Baseball and also help teenage players prepare for tryouts in the Dominican Republic. When Flores left the Phillies last month to take a job with the Baltimore Orioles, it seemingly opened an opportunity for the team to bring back Samuel. It was immediately clear, however, that the Phillies had zero interest in reopening that door even though Samuel had been a positive mentor to center fielder Odubel Herrera, who had just gone through the worst year of his career. It was a tribute to Samuel that Herrera had become such a good defensive center fielder after spending almost his entire minor-league career as a second baseman before the Phillies selected him in the 2014 Rule 5 draft. For whatever reason, Klentak and Kapler appear to be opposed to having former Phillies on the big-league coaching staff. In fairness to them, however, there are 29 other teams in big-league baseball and none feels the need to hire an experienced and loyal man who has the ability to teach and communicate with players in two languages. Juan Samuel is as good as they come on the field and off. It is baseball that is missing something by not having him around.